If you want something WARM, SOOTHING, TASTY and QUICK TO MAKE for dinner, this three bean chili is the bomb! 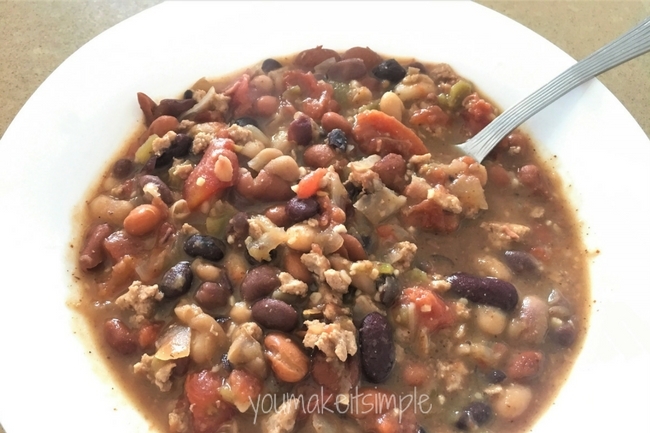 I revamped one of my chili recipes so it can make it up in the Instant pot. If you don’t have an Instant Pot, you seriously should consider it. Worth every penny! I have two now, and use them simultaneously all the time. This chili recipe can be made without the Instant Pot, just takes a little more effort. With the Instant Pot, you don’t have to babysit it. Just throw all the ingredients in and while you wait you can make up a batch of yummy corn bread. You can have a healthy dinner made up in the time it would take you to run to a fast food joint. Back to the three bean chili. 2- Brown the ground meat and remove any unwanted grease. 3- Add the rest of the ingredients to the pot and give it a little stir. 7- Adjust the time for 15 minutes. 9- When the pressure has come down, remove the lid and enjoy! This Chili freezes really well. You can double the batch and freeze some for another QUICK MEAL! You can also make this up in a stock pot if you don’t have an Instant Pot. It is pretty much the same instructions. Simmer over medium-low heat covered for 30 minutes.